The World Conservation Union (IUCN) lists three vanga species as Vulnerable, facing a high risk of extinction, and one as Endangered, facing a very high risk of extinction. The species listed as Vulnerable are the red-shouldered vanga, due to restricted territory and a small population; Bernier's vanga, because of its small population and deforestation; and the helmet vanga, because of limited territory and deforestation. Van Dam's vanga is listed as Endangered due to its very small range and fragmented populations. Physical characteristics: Bill-to-tail length is 8 inches (20 centimeters). The male has a black head, neck, and chest, with blue highlights. The bill is blue-gray, the eyes are dark red, the upperparts are reddish brown and the belly is white. The wings are red-brown and brown. The female is similarly colored, the differences being white cheeks, chin, and throat on the otherwise black head, and a gray collar. 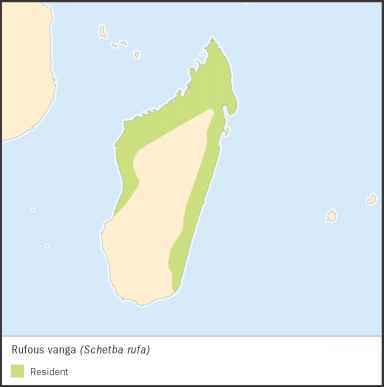 Geographic range: The rufous vanga lives in Madagascar, in rainforest along most of the east coast, and in tropical deciduous forest in the northwest. Habitat: The rufous vanga prefers undisturbed rainforest from sea level to 5,400 feet (1,800 meters) above sea level, and undisturbed or slightly disturbed tropical deciduous forest. Diet: The rufous vanga feeds mainly on insects and occasionally on small lizards. Behavior and reproduction: The rufous vanga picks insects and lizards from branches and tree trunks or flushes them from ground litter. Of the various vanga species, this vanga spends the most time foraging on the ground. Often an individual sits on a low branch for long periods of time, watching for moving prey. The rufous vanga sometimes follows another bird, the white-breasted mesite (family Mesitornithidae). The mesite runs through ground litter, flushing out insects and other small animals for its own feeding, the vanga helping itself to some. It is not a mutually beneficial relationship; the vanga merely takes advantage of the mesite's feeding tactic. Rufous vangas live in groups of four to eight, and may join in mixed-species feeding flocks with other vangas or with bird species other than vangas. Their voice is melodious, and pairs may sing duets, often punctuated by clacking their bills. The rufous vanga is one of the few vanga species whose reproductive biology is even partly known. The breeding period runs October through December, and chicks are born November through January. A female lays one to four eggs. A noteworthy aspect of reproduction in this species, seen in other bird families, is "helping behavior." During the breeding season, a nesting site may be occupied by one or two extra individuals in addition to the nesting pair. These "helpers" will fill in for the parents, sitting on the eggs and even feeding and guarding the chicks while the parents are out feeding. Some of the helpers are immature males, recognized as such by their spotted necks. Rufous vangas and people: Rufous vangas do not interact with humans in any significant way. Goodman, Steven M., and Jonathan P. Benstead. The Natural History of Madagascar. Chicago: University of Chicago Press, 2003. 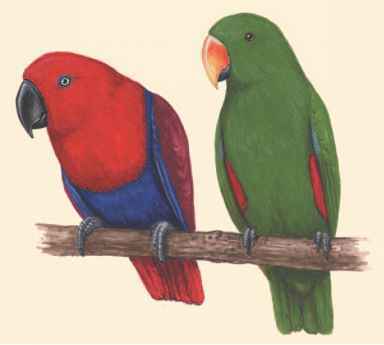 Morris, P., and Hawkins, F. Birds of Madagascar: A Photographic Guide. New Haven, CT: Yale University Press, 1998. Goodman, S. M., A. F. A. Hawkins, and C. A. Domergue. "A New Species of Vanga (Vangidae) from Southwestern Madagascar." Bulletin of the British Ornithological Society 117 (1997): 5-10. Graetz, J. "Nest Observations of the Helmet Vanga, Euryceros prevostii." Newsletter of the Working Group on Madagascar Birds 1, no. 2 (1991). Safford, Roger. "The Helmet Vanga, Euryceros prevostii." Bulletin of the African Bird Club 7, no. 1 (March 2000). Yamagishi, S., et al. "Extreme Endemic Radiation of the Malagasy Vangas (Aves: Passeriformes)." Journal of Molecular Evolution 53, no. 1 (July 2001): 39-46. Birdlife International. http://www.birdlife.net (accessed on June 20, 2004).